In this IBM® Redbooks® publication, we show examples of using an ESB to transform and enrich an event received from Customer Information Control System (CICS®) Transaction Server. We also show an example of enriching an event. 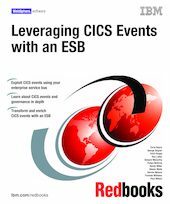 This book is intended for anyone planning to use CICS events with an ESB. Part 1, "Introduction" on page 1 introduces event processing. We explain what it is and why you need it. We also review the CICS TS implementation of event processing. We discuss enterprise service bus technology and how to integrate event processing with an ESB. Part 2, "Environment" on page 55 of the book focuses on our environment and the application we chose to use.